the incumbent won two (2) wards 1 & 2. "It takes Heart, Soul and a lot of LOVE...to move the Delta FORWARD"
WE all have a personal stake in what happens over the next few years in Indianola. What concerns me most is the 36.2% + poverty rate in our city. I care equally as much about the lack of cultural enrichment and educational activities for YOUTH in the Mississippi Delta. Develop a comprehensive Strategic Plan that attracts a major theme park to Sunflower County. By doing so we will develop incentives and opportunities for BETTER public schools, community educational programs, entrepreneurship, jobs, healthier lifestyles, racial harmony / equality; and, displace economic disparity, crime, and the impoverished mindset prevalent in Indianola. We MUST work together to improve our community—by encouraging EVERYONE to clean up our streets, bayou, parks, etc. We have some huge unmet challenges here in Indianola, and how YOU decide to vote On December 10, 2013, is vital to OUR success. I have the HEART, SOUL and LOVE to fight for YOU and the things WE believe in. If I can count on YOU, too -- well, that's when WE get things done…in Indianola, Mississippi. 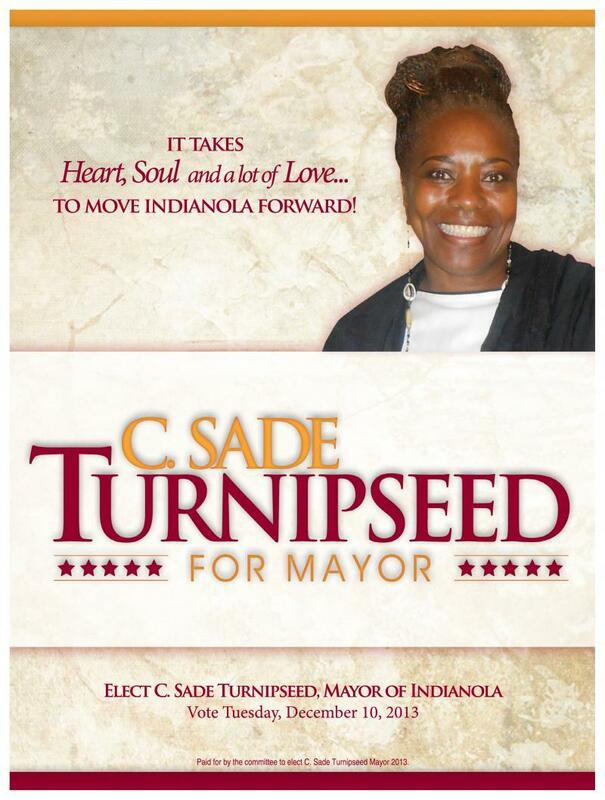 I truly need your help…PLEASE go to the polls and VOTE! P.S. – We Can Make History Together…Let’s take better care of people living in poverty and become a shining example to everyone in the Mississippi Delta! For the sake of our children…our future…WE MUST DO BETTER! While I share the sentiments of the Enterprise Tocsin editor Charlie Smith’s closing remarks in the November 14th editorial, where he quoted the New York Times op-ed, “…relationships can trump race in small towns.” I do take issue, however, with remarks in the opening paragraph that states, “the December general election is an ‘almost’ assured victory [for the incumbent mayor].” I am “almost” offended by this prediction. Smith, in a quote of his own while referencing the progress in race relations stated, “That’s good to see and a hopeful sign for the future.” Indeed. I whole-heartedly agree with the editor that the African American community has proven to the world an uncanny, though unreciprocated, ability to be forgiving of past deeds of injustice, brutality and cruelty at the voting polls, and socially in their community service groups, churches and everyday lives. This point should not be lost on the fact that many of those injustices happened here, in Indianola, Mississippi, to some amazingly strong and resilient individuals like Fannie Lou Hamer and all those who came before her. For their ability to forgive, I applaud them. But, I can’t help but wonder why the White community isn’t reciprocating and showing the same confidence and trust in racial relations? In wards I, and II, which are the two wards with the largest white population of voters, we see results that reflect an uncompromising resistance to acceptance and change. With an overall total of 952 votes cast: 732 went to the White candidate and 220 for the two Blacks, combined)…check that! Just what does this mean? Please, help me to understand. To whom was the editor referencing in his closing remarks? Who are the ones that are being held accountable for building relationships? Surely, it cannot be left up to one segment of the community, and not the other. I truly wish Smith had stressed this very critical point, instead of throwing shade on the outcome of a campaign I have yet to wage. And for the record, as a citizen, it is my right to be afforded the opportunity to run a fair and unbiased race for mayor, without subtle suggestions that it is a waste of my time, as inferred in his editorial. But, then again maybe he knows more than I about how citizens of wards I and II will ultimately vote. I certainly hope not. After all, I chose to live in Indianola, Mississippi because of its promise of social “harmony” and the proclaimed efforts to heal the racial divide and blatant inequities. But, I am convinced that the African American members of this community do want harmony and in an “almost” desperate way need to heal. To the extent that they are willing to trust the promise that our mayor will oversee, in an “almost” paternalistic way, their well being I find interesting. And to also trust that the leaders of this community will look out for their best interest, politically, economically and socially. Unfortunately, I find this to be “almost” delusional. After all we live in a community that is 84% African American with a poverty rate that is fast approaching 40% and a public school system that is in deplorable condition, both physically and academically, even under the watchful eye of the government, yet there is no outrage…from either the White side, or the Black side of town. To what is this attributed? Probably just bad luck, huh? Or, perhaps it is because folks have grown accustomed to the unevenness and the blatant historical inequities in Indianola…does one just grow accustomed to these things…I pray, I never will. Regarding the “professionalism” the editor alluded to in referencing the incumbent’s successful campaign, he mentioned it was due in large measure to the undisclosed proceeds, which may or may not have been raised by “supporters.” I find it interesting that the he was so impressed by the willingness of people with money to spend a relatively small portion of their wealth to purchase power and influence, in their own political campaigns. In my own defense, I believe, I will be a great mayor for Indianola because I truly love what I see as potential for “real” racial harmony in this community, particularly as far as the children and the elderly are concerned. That has been the focus of my work, since moving to Mississippi nearly ten years ago. And, I have never believed it was necessary to wait until political season to demonstrate my commitment to the people in my community. If, by chance I am truly embraced by all members of all wards of this city, I believe people will witness an amazing transformation in a relatively short period of time. It’s “almost” like magic…I predict things will begin to unfold in a substantive way like the neighborhoods will brighten, crime decreases and the impoverished mindset disappears. This is due to the fact that, we are who we are, a very creative people. And I am passionate enough to find the tools to help remedy the concerns that create stagnation and distrust. Please remember, we are a people who come from a very long tradition of women who made a way out of no way. The way forward is to embrace what comes natural for us…creativity! Please help me help make this place special!